Sandwich Arts Alliance member and Secretary, doing a watercolor of Bob King & Tobin Wirt's beautiful yard that was seen by many on the Hydrangea Tour, July 14, 2015. With over 150 people touring each garden, the Sandwich Garden Club was very pleased as the $5 donation they received from each attendee will now be used for the Club to reach their goals. This 501(c)3 Club not only strives to improve members as gardeners but also encourages members to share their interest with our community by providing a wealth of opportunites to give back. This might include digging, planting and maintaining gardens in public areas around town; holiday design, preparation and installation of wreaths and swags and other greenery around town; selling and planting thousands of daffodil bulbs for our first ever Daffodil Days; making flower arrangements for COA shut-ins, for hospice patients and Meals on Wheels clients; planning, digging up, repotting and transfering hundreds of plants for our yearly, terriffic Plant Sale. From the sale of the member donated plants, the Club gives donations to the Food Pantry, Heritage Museum, books to the Sandwich Library, and other miscellaneous donations during the year. It is also not unusual for members to get an email to come and help out with an upcoming gardening project if we can make it. For more information about the Sandwich Garden Club, please go to www.sandwichgardenclub.org. 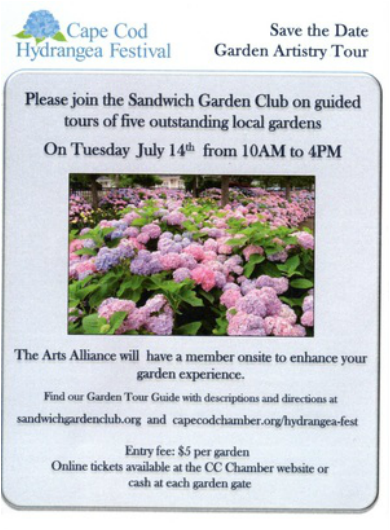 Please join the Sandwich Garden Club on guided tours of five outstanding local gardens. Find our Garden Tour Guide with descriptions and directions at sandwichgardenclub.org. Online tickets are available at the CC Chamber website or are available for cash at each garden gate. 1. Bob King & Tobin Wirt, 9 Summer Street featuring Alliance artist Patricia Mosca. Click here to learn more about Pat. 2. Roger Wilmot, 430 Quaker Meetinghouse Road, East Sandwich featuring Alliance artist Rosalie McCarthy. Click here to lean more about Rosalie. 3. Sally Moore, 11 Notre Dame Lane, Mashpee (off Pimlico Pond Road) featuring Alliance artist Cris Reverdy. Click here to learn more about Cris. 4. Jan Kasper, 6 Aviators Lane, Sandwich featuring Alliance artist Diana Payne. Click here to learn more about Diana. 5. Alan Budney, 267 Meiggs Backus Road, Sandwich featuring Alliance artist Margaret Ellsworth. Click here to learn more about Margaret.